The weather is really cooperating so far. The temps have warmed up to the 60’s today and no rain in the forecast until Friday. Unfortunately there is no wind for sailing today, but that makes crossing the sometimes choppy Albemarle sound a piece of cake. We shoved off the dock this morning at 7AM hoping to get thru the Pungo Canal before dark. 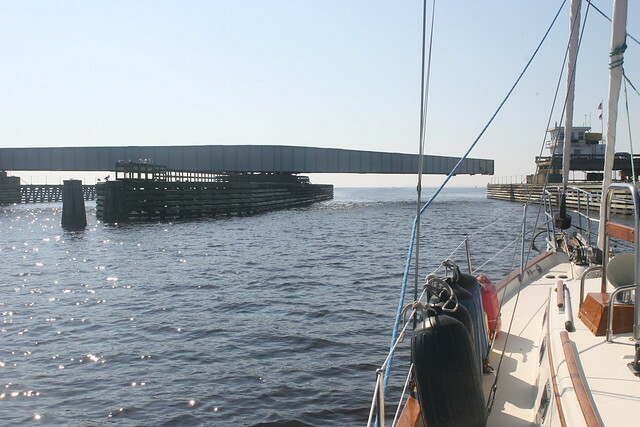 The trip across the Albemarle Sound was very quiet and then it was thru the Alligator River swing bridge. Last time we did this the winds were around 35 knots and they won’t open the bridge above 34 knots. We managed to get thru between gusts. We did make it thru the Pungo Canal and anchored just outside the west end of the Canal. No internet, but if we had just gone around the corner towards Bellhaven….. We had a nice dinner of hamburgers on homemade rolls aboard Onward. Tomorrow is just a short trip into Bellhaven to visit with old friends Richard and Janet, so we can sleep in.